Swansea is the oldest seaside town on Tasmania’s east coast and a must-see in any itinerary. We set off along the Tasman Highway to Swansea heading towards Orford, a coastal village that is approximately 73 kilometres (45 miles) from northeast of Hobart on a beautiful sunny, if cool, day. The scenery was spectacular and I gazed in awe at some of the most beautiful country I had ever seen. 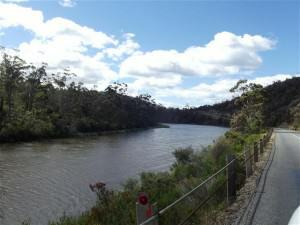 Coming into Orford we followed the winding and very narrow road beside a sparkling Prosser River – it was so beautiful it just took my breath away. The river feeds into Prosser Bay and the town of Orford is nestled on the banks of the river at its mouth. We stopped there for lunch and John, especially, was captivated by the boats moored there; beautiful and expensive notwithstanding, it was the number of them that fascinated him. There had to be at least one and most likely more than one for every member of the town’s population! After lunch we set off to continue our journey to Swansea but the Tasman Highway passes right by Raspins Beach on the northern outskirts of Orford where the Prosser Bay opens out into the sea. Sheltered and calm, it would be the perfect place for a family picnic and we stopped for a few minutes. It was so quite, the water sparkled and the trees moved gently with the breeze; it was like being on another world. But the day was moving on and so should we and so we were soon back on the road. It was a fairly uneventful journey and it wasn’t too long before we arrived in Swansea. Our travels along the east coast so far had been one long series of oohs and aahs and, frankly, I didn’t expect that to end anytime soon. 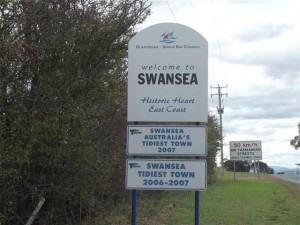 Swansea is a picturesque seaside town with a rich colonial history. Nestled on Great Oyster Bay across from the Freycinet Peninsula, the town was established in the 1820’s and is packed with historic homesteads and convict-built architecture. 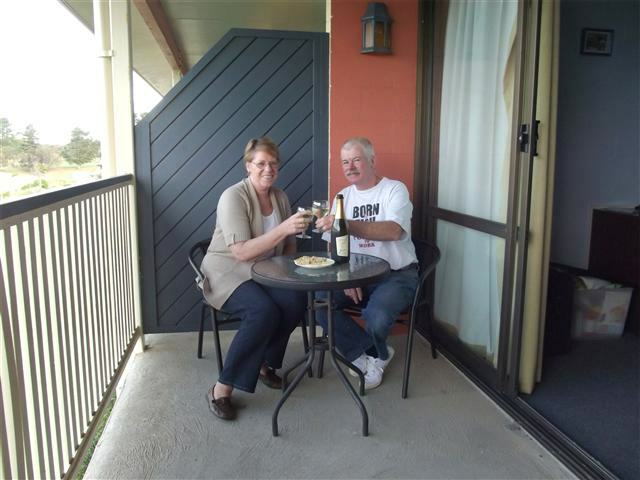 We took a room at the Swansea Motor Inn ([star][star][star]) overlooking Great Oyster Bay; the view from our balcony was stunning and we’d been told that the sunrise is particularly beautiful. So, settled in our room, we set off to explore and headed to Kate’s Berry Farm. How fascinating is this! We had ice cream in Kate’s Just Desserts Café and wandered around looking at the hand-made chocolates (John, not me), and the fruit wines (me, not John), all made on the premises from locally sourced ingredients and their own berries. And what a great location with amazing views out over the bay! 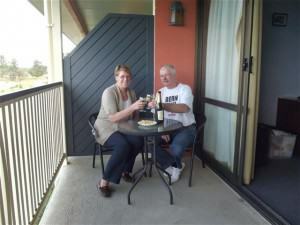 did the temperature and so we returned to our room where our bottle of Two Tails Sparkling Wine was chilling nicely. We opted to sit out on the balcony and enjoy the view along with the wine and in spite of the chill it was really a pleasant evening. We awoke the next morning to a most brilliant sunrise; it just took my breath away and that was just the start of a brilliant day filled with east coast wonder. We set off for Coles Bay and the Freycinet National Park. Freycinet Peninsula was named after the French explorer Louis de Freycinet who was one of the first to have published a comprehensive map of Australia’s coastline. Freycinet National Park was founded in 1916, making it Tasmania’s oldest park and it consists of granite mountains surrounded by stunning bays with water of the deepest blue and pristine sandy beaches. The dramatic peaks of The Hazards welcome you as you enter this wondrous world where the mountains have a distinctive pink tint due to the presence of pink feldspar in the rock formations. 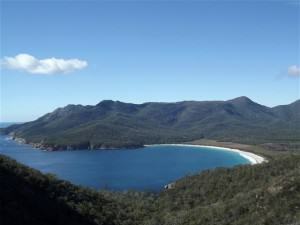 The highlight attraction of the park is Wineglass Bay, recognized across the world as one of Tasmania’smost beautiful features, which is remarkable in this magic place where everything is beautiful. We took the walk to the lookout over Wineglass Bay, a 1.5-kilometre trek that is, supposedly, moderately difficult with a 10% gradient. Well, I found out just how unfit I really am! I had to stop and rest a few times, more than a few actually, but oh, it was worth it! Wineglass Bay is absolutely stunning! With its deep blue water combined with this sparkling day, it just astounded us! No words can adequately describe it! Mt Freycinet and Mt Graham form the backdrop of the bay and the stretch of white sand curving around was almost too bright to look at. Of all the amazing and beautiful places we have seen on this trip, Wineglass Bay has to be the one that will stay with us forever. 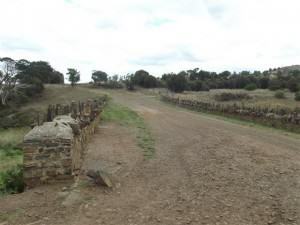 It was captivating and I didn’t want to leave but John reminded me that we had other places to see that day and so, with a great deal of reluctance, we had to move on. 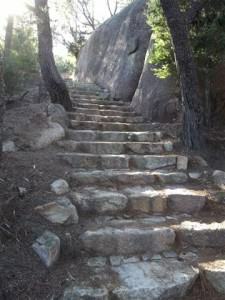 The walk down was certainly much easier than up and much quicker and before too long we were on our way to Bicheno. This lovely little seaside town has a very colourful history that includes whaling, sealing, and coal mining. There is much to see and do in Bicheno including diving at Governor Island Marine Reserve, and a motorcycle museum but today we were off to the East Coast Natureworld, one of Tasmania’s premier wildlife parks. Tasmanian Devils, cute but you wouldn’t want one for a pet! I was determined not to leave Tasmania without once more seeing a Tassie Devil. They are so cute and I wondered what they would be like as pets but we learned that their jaws are a hundred times more powerful than a dog’s jaws, they can eat a third of their bodyweight in one meal (that’s equal to a man eating a 25kg steak in an hour), and their head and neck, when fully grown, comprise a quarter of their size. They eat fresh kills and leave nothing behind; they eat flesh, organs, bones, fur, and even the hooves if the kill has them! Delightful! Give them lunch, not BE their lunch! But Natureworld is not just about Devils. Many animals and birds roam free, including kangaroos, and we were able to feed them by hand. We visited and watched the feeding in Nocturnal House and went into Old Macdonald’s Farm where, with bag of food in hand, John was almost assaulted by a pony, a sheep, a goat, several kangaroos, and assorted ducks and geese! The only animal that couldn’t get to him was the pig; it was in a pen! We followed that with a walk through the aviary and into Wallaby Walk, visited an emu, and John wandered through the reptile section. That is definitely not for me; I don’t like snakes! But for me it was all about the Devils. We watched the feeding and listened to a talk about the cute little creatures. The Tasmanian Devil is found nowhere else in the world and is the largest of the marsupials that eat meat. They generally live in forests and can run at a top speed of 13 kilometres (8 miles) an hour. In the late 1990’s Devils began contracting a disease which is now known as the Devil Facial Tumour Disease and has reached epidemic proportions. 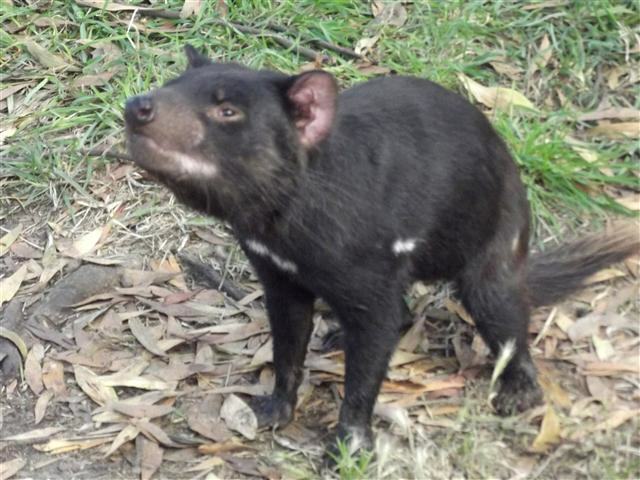 The disease is fatal and today scientists are working to find a way of stopping it before the Tasmanian Devil is lost forever. That piece of information had a sobering effect on us and I don’t think we’ll ever look at a Tasmanian Devil the same way again. It was getting close to closing time and we left Natureworld after seeing the Devils. 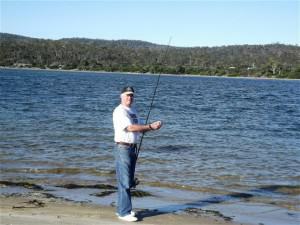 But John wanted to throw a line in so we headed back toward Swansea and stopped once more at Bagot Point. Unfortunately, all he managed to catch this day was weed! It was quite windy and cool and the current wasmoving pretty fast. Still, you would have thought that he’d got, at least, a nibble but it wasn’t to be. On our way back along the road to Swansea he noticed a sign to a place called Yellow Sandbanks and never being one to turn away from a dirt track he decided to explore. 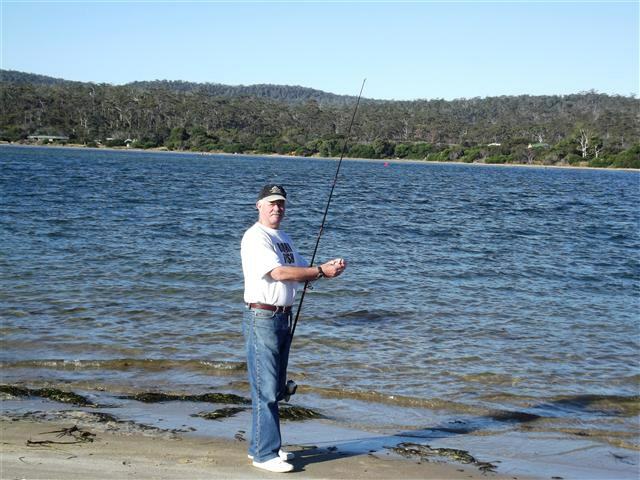 The track led down to a jetty and John thought he might throw a line in here. Sadly, he didn’t have any luck at all – he didn’t even catch weed there! It was time to pack it in for the day and so we wandered back to the motel. It was time to move on and we started to pack up our gear. Tasmania is Australia’s smallest state but there’s an awful lot to see and do and our time was limited so it was on to our next stop on this journey of wonder.